In this article, we have simplified the complete process of exporting Apple Mail to Outlook. Users can choose from the different approaches to convert Mac Mail emails and access them in MS Outlook 2019, 2016 & below versions. Apple Mail is an email client included with every Mac OS X 10.0 and above. It provides multiple features to not only manage emails but also handle contacts, tasks, calendars, etc. It has become one of the most preferred email client for Mac users. On the other hand, Microsoft Outlook email application is available for both Windows and Mac. With advanced features and better security protocols, it is often preferred over the other email clients. Sometimes Apple Mail users want to switch to Outlook and look for ways to do so. And that is exactly what this article help users to achieve. Apple Mail makes use of the MBOX file format to save all its emails and attachments. While MS Outlook stores its mailbox items in PST files. And unavailability of any native means in Outlook to import this MBOX file makes this format incompatible with Outlook. However, there still are workarounds as well as specialized software solutions to make this conversion possible. Users can go through both the defined methods and choose the approach best suited to their needs. This workaround requires users to have four different email clients on the same Mac system. The required email applications are: Apple Mail, Eudora, Outlook Express and Microsoft Outlook. After installing these mail clients, follow the given steps carefully as a single mistake can lead to data loss. Step 1: Firstly, the user needs to locate the Apple Mail MBOX files. In case the user has orphan MBOX files, directly jump to step 2. Step 2: Next, install Eudora and rename the MBOX files with .mbx extension. Afterward., copy this file to Eudora local directory. Step 3: In the next step, users need Outlook Express to import the messages from Eudora using its native import option. Step 4: And, at last, users can transfer the files from Outlook Express to Outlook with inbuilt feature. Lengthy Process: The overall procedure is lengthy and time consuming. Difficult to Execute: Any error or mistake on user’s end can result in severe data loss. Requires Technical Expertise: In order to perform the task seamlessly, a user should have good technical knowledge of all associated email clients. Successful results not assured: It is not preferred for bulk file conversion since the results are not guaranteed. In just three simple steps a user can access all the Mac emails in Outlook interface. First, we need to export mailbox of Apple Mail, then convert emails to PST and lastly import mailbox to Outlook. This completes the process of exporting mailbox from Apple Mail, now you need to export this mailbox file into Outlook PST format. Apple Mail exports the mailbox file in MBOX format, so in order to access them in Outlook, there is a requirement of Mac MBOX Converter. It allows a quick and secure conversion to PST file format. And since MS Outlook(Windows/Mac) supports PST format, it can easily import the converted PST mailbox afterwards. The last approach to import exported Apple Mail to Outlook. 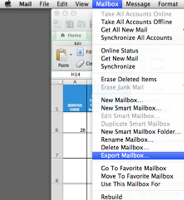 Here are the steps to import mailbox to Microsoft Outlook on Mac OS. Click on Finish when the import process is complete. Now use Apple Mail mailbox in Microsoft Outlook with all the attachments. Follow these stepwise approaches with any version of Apple Mail and MS Outlook. The article encloses the complete guide on how to export Apple Mail to Outlook on Mac OS X. Both the manual approach as well as the specialized tools are mentioned to fulfill the requirements of Mac users. However, it is recommended to go for the automated approach since there are some limitations associated with the manual solution. But ultimately, it is upto the users to decide which method to opt.